Open carrier transport services provide a cost-effective and convenient way for individuals and businesses to ship an automobile from one location to another. 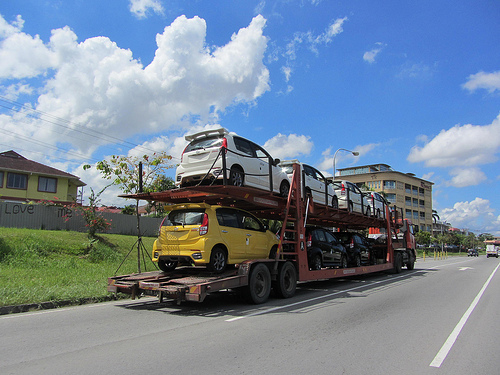 It is a type of auto transportation option in which cars are transported from point-to-point in large uncovered trucks that are designed to carry between 10 and 12 automobiles at the same time. Most auto shipping companies these days offer open auto transport as the default option for shipping automobiles around the country. Open carriers were originally used by automobile manufacturers to ship new cars to dealer locations around the country. Over the years, shipping companies began using the same carriers to transport vehicles for residential and commercial customers as well. Today, open auto transport is the primary manner in which over 90 percent of cars are shipped from one location to another in the United States. They offer a substantially cheaper form of vehicle transportation compared to enclosed carriers. The biggest difference between open carrier transport and enclosed carrier transportation is that, with open carriers, your vehicle will be exposed to the elements during transit. Generally, automobiles transported in open carriers are more susceptible to damage from road debris, grime and wind compared to vehicles transported in fully enclosed carriers. In reality, however, a vast majority of the cars transported on open carriers rarely sustain any serious damage during transit, which is why car manufactures continue to use them to ship new vehicles to dealer locations even today. When you sign up with an open auto transport service, the company will either send its car trailer out to your location to pick up the vehicle or have you bring the vehicle over to its terminal facility. The driver will then inspect your vehicle and make a note of any visible external damage, scratches or dents. Your vehicle will then be loaded onto the truck via a movable ramp. It is secured in place using chains and tie-down straps and transported to its destination. Before the vehicle is handed back to you, the driver will allow you to inspect the vehicle to make sure that it sustained no damage during transit. If you notice any damage, it is your responsibility to immediately notify the driver. Remember, most car transporters will not compensate you for any damages if you do not immediately notify them about the problem. Always make sure to compare price quotes from at least five or six companies before choosing a car shipping company. Open car transporters charge for shipping based on the distance of the shipment and the size of your vehicle. Generally, the bigger your car, the more you can expect to pay to ship it. Always ensure that any open carrier transport company you choose is fully licensed, bonded and insured to ship vehicles.